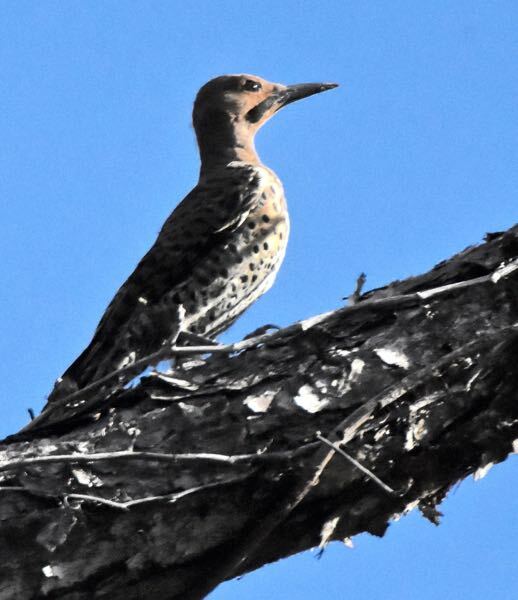 Northern flicker woodpecker, photographed at Royal Palm Beach Pines Natural Area, Royal Palm Beach, Palm Beach County, in July 2016. The northern flicker, Colaptes auratus, is the unwoodpecker in many ways. In certain behaviors and features it reminds us of a dove. It's one of the most common woodpeckers, found in almost every corner of North America. It is a full-time resident of Florida but can be found in the far north of Alaska and Canada and south into Mexico, Central America and the Caribbean. 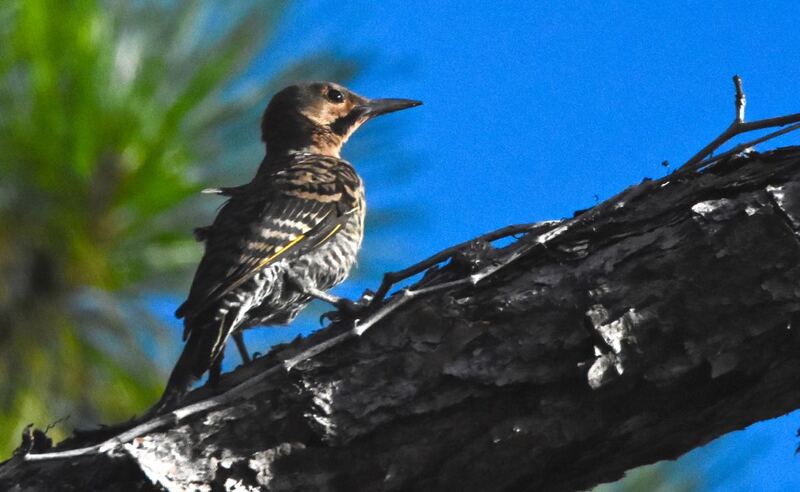 The Florida Fish and Wildlife Conservation Commission rates it the fourth most common of the seven woodpecker species that breed in Florida. Part of the population is migratory, especially along the northern tier of the United States into Canada. 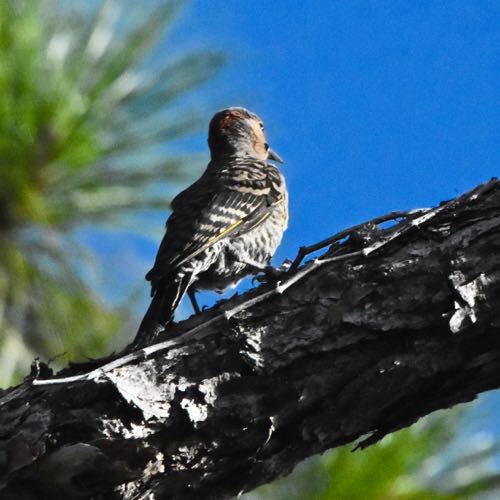 Most northern flickers there will flee the cold come the fall and find their way to warmer spots, including the Sunshine State. Throughout the United States and farther south, though, they pretty much stay put year round. We call it the unwoodpecker, because it forages for insects on the ground rather than than in trees and snags (dead trees). Walk through the woods where they're feeding and you might flush them like doves. They're also more brown, less black and white than most woodpeckers. There are two variations of northern flickers — the red shafted and the yellow shafted — roughly divided by geography. The names refer to the color of the shaft of the flight feathers, but there are other differences between the two types (they were once considered separate species). Florida, as well as the rest of the U.S. east of the Great Plains, is home turf for the yellow-shafted variety (you can see the yellow in the photos at the top and bottom), while the red-shafted occurs farther west. The two do hybridize where their ranges meet. Male flickers have a "moustache" streaking diagonally from the bill; the yellow-shafted flicker has a black moustache, while the red-shafted 'stache is red. The face and crown of the head in both have a splash of red and a black "bib" where the throat meets the chest. Flickers are large, as woodpeckers go, about foot long, with a wingspan that can reach 20 inches. As noted above, flickers forage on the ground a lot, rooting up ants and beetles in the dirt. According to the FWC, in summer as much as half their diet can be ants and beetles. A study done in the 1930s found that one northern flicker had eaten nearly 5,000 ants in one sitting. In fall and winter, their diet swings to mostly seeds and berries. Generally, northern flickers nest in tree cavities that they excavate, a process that can take nearly two weeks, with both mates pitching in. The floor of the hole is covered with wood chips. Occasionally, they'll nest in an abandoned kingfisher or bank swallow burrow, or even on the ground. Females lay a single clutch of five to eight eggs, which take two weeks or less to hatch. Both mom and dad handle sitting duties, with dad doing so mostly at night. Both parents feed their offspring, regurgitated bugs, were guessing. It takes about four weeks for the kids to fledge, but mom and dad continue to feed them even when they can fly. Eventually, they just lead them to places where food is abundant and let them have at it. Northern flickers are members of Picidae, the woodpecker family.